I am in love with Japanese food. I admit it. I love the large variety of vegetables they serve with every meal. Tasty meats and fish, and rice... oh lovely rice. yum. Especially fond of Bento style cooking. This is you Japanese version of a packed lunch, only I don't just cook bento style for eating out. I like the quick and easy nature of bento dishes. You can cook two meals worth in under twenty minutes. I whip up something yummy each morning, then keep the dishes in the fridge for lunch and dinner. That way, I don't have to interrupt my day to cook. It's the perfect fast food. Anyone have a favourite Japanese food or recipe they would like to share? My general impression is that it's all raw fish apart from the raw whalemeat. Also it tends to glow in the dark. Number 4 Son is the Japanese foodie in our family. I must say I have enjoyed the Japanese meals he has dragged us to in Canberra, although I have no way of knowing how authentic they were. I've even enjoyed the rice-and-unidentified-substances-inexplicably-wrapped-in-bits-of-seaweed* dishes he has prepared himself. *The Japanese no doubt have a word for it… Like they have a word for "singalong-out-of-tune-and-with-the-wrong-words-and-rhythm-to-out-of-date-pop-hits-in-a-pub-preferably-whilst-drunk"
I love Japanese food, specifically sushi. I have no qualms about eating raw fish, but I draw the line at whale, cooked or not. Almost anything else is fine, though. Roy recently found Wasabi Peas. They are amazingly good, all crunchy and covered in something akin to horseradish. I make onigiri (Japanese rice balls) for eating when I'm on night shift. First cook your rice. You can use any short grain rice. Sushi rice is traditional, but risotto rice (e.g. arborio rice) works just as well. Don't use normal long grain rice - it doesn't work. You need to rinse it first in water until it runs clear. You cook it in two cups water for every cup of rice you use. Put in a pan, bring it to a boil then simmer covered for 15-20 minutes. When all the water is absorbed and the rice is done, remove it from the heat and leave it to cool for a little while. The simplest onigiri are plain rice but you can put lots of different fillings in them. The traditional method of shaping onigiri is to use wet hands dusted with a little salt to stop the rice sticking, but there is an easier way. Put a couple of tablespoons of the cooked rice in the center of some clingfilm (aka plastic wrap). If you're going to put a filling in, put a small amount of it on top of the rice then add another spoonful of rice to cover it. I like to dampen the inside of the clingfilm and sprinkle it with a tiny amount of salt, to get that same good salty taste you get from shaping it the proper way. Gather the clingfilm up and twist the top tight with one hand. Use your other hand to shape it into a ball. Unwrap the rice ball and you're done! Wrap it in a fresh bit of clingfilm if you're eating it later. If you want to take your onigiri a step further, wrap your onigiri in a sheet of nori (roasted seaweed, like they use in sushi), or roll in in a flavouring e.g. sesame seeds, or furikake (japanese seasoning made of salt, seaweed and spices). Traditional fillings include umeboshi (Japanese pickled plums) or fish, but you can put almost anything in it. Spicy, salty or sour thing work well. - Anything teriyaki style e.g chicken, pork or beef chopped fine. Use only the tiniest amount of sauce - enough for flavour but not enough to make the rice damp. - Char shui pork BUT avoid any fatty pieces. It'll soak through and make it fall apart. - Minced up ham or chorizo sausage. Actually any cooked sausage is good! - Well drained pickles. Japanese style pickles are good but regular Western style pickles work as well. - Curry - again limit the amount of sauce. Fab either in a bento box or on their own as a snack. You can also make crispy onigiri - it's called Yaki onigiri. It has crispy, almost burnt rice crust on the outside, with a white fluffy inside. Make your onigiri like normal, but shape it so it has flat sides. Triangles are traditional (try packing your rice into a cut off corner of a plastic bag), squishing it into a biscuit cutter or press it into a plastic box to make cubes. Heat a little bit of oil in a pan until its nice and hot (for a bit of extra taste, try sesame oil. Normal cooking oil works just as well though). Fry until golden then turn over and fry the other side. I sometimes fry the large flat sides of triangle shaped ones then wrap nori round the thin edges. Alternatively, brush the sides with a little soy sauce or BBQ sauce then grill again to harden. These are nicer unfilled. I sometimes do one plain nori wrapped onigiri, a filled one and a yaki onigiri in a bento box with some seaweed salad, some cubes of cheese and some fruit. I adore onigiri. I actually just finished making a bunch of this stuff for onigiri filling. It's basically pickled Kelp but tastes way better than advertised. You have some great ideas for fillings. Thanks for sharing. Do you need to keep some of those filings in the fridge (like the salmon and cream cheese) if you are not going to eat them right away? Most types of filling I do - there's also the issue with cooked rice as well. A lot of Japanese sites though seem to say they're okay as long as its eaten the same day - and not kept near a warm radiator! If you don't have access to a fridge and you're a little worried, the best filling is umeboshi as it is claimed it has some antibacterial properties. Roland Deschain wrote: ... Roy recently found Wasabi Peas. They are amazingly good, all crunchy and covered in something akin to horseradish. I like the Wasabi Nuts (peanuts en croûte with wasabi) more then the peas. Do you know them, too? Trampledbygeese wrote: I adore onigiri. I actually just finished making a bunch of this stuff for onigiri filling. It's basically pickled Kelp but tastes way better than advertised. Oooh. Just read the linkie. I use konbu quite a lot make dashi stock. I'm going to have to store it up once I've finished with it to make that. I need to stop this post before I go eat something again. Must wait until suppertime. No more devil's food cake. I've got the impression that the Japanese are falling out of love with whale meat. 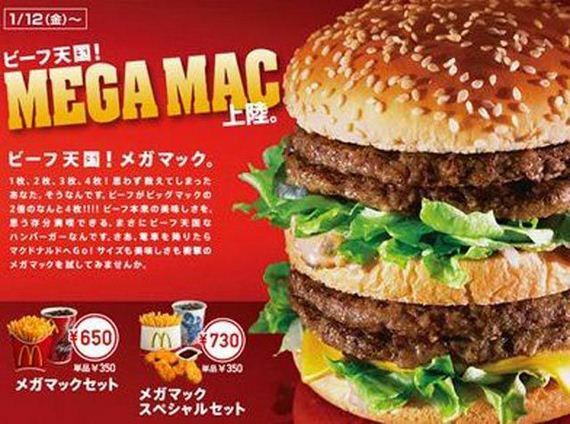 Consumption of it in Japan have fallen dramatically in the last few years. 95% of Japanese never or rarely eat whale meat. Consumption is mostly confined to a few coastal towns. The body responsible for selling whale meat, obtained from their "scientific" whaling program has, in the last few years, failed to sell over 3/4 of its supply. Which is good because they rely on selling it the meat to cover the costs of the whaling fleet's expeditions. If they can't sell it, they can't fund the whalers. Those Bento (rice ball) were exceptional. I do have a Japanese cooking book and will now try out some of those recipes. As for 'Sushi' -- I am yet to be sold. Too much experience fishing, fileting and seeing what crawls out. I would only buy Japanese imported Sushi as the radioactivity should have killed the bacterium's you are eating, much less the worms. Whale meat?? They still are buying whale kills from the Makah tribe in WA. which has been given the approval to 'harvest' them as it is part of their tribal heritage. Guess where the meat goes. YUP! Japan! Same for the biggest shrimp harvested off Alaska. The American consumer never gets to see them. For example Jumbo Shrimp have 21 to 25 shrimp per pound. 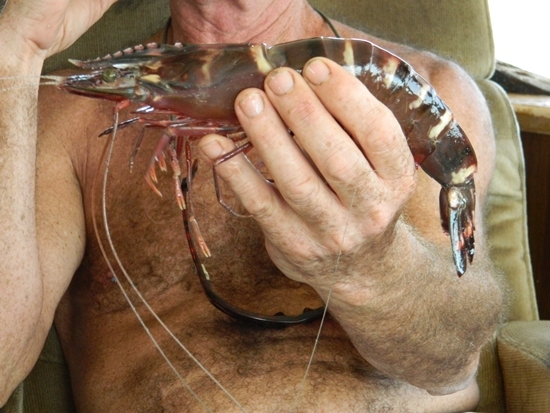 'large shrimp' are 41-35 per pound. HA! What the Japanese were buying were "COLOSSAL" These are 14 to a lb. I must make note that my shrimp experience was being served giant #6 Alaskan shrimp so large they stretched across the plate. Barbecued in a like manner ... But it was the roe that was beyond belief! If I had known I was going to live this long, I’d have taken better care of myself. Holy cow that's a big shrimp! Imagine the scampi that could be made with that!